If you have not so fresh anymore carrots in your fridge and you don't know what to do with them, then make a cake with them! 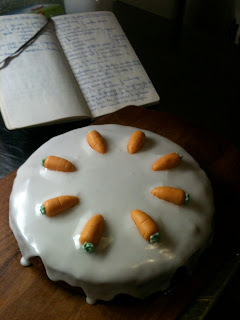 That was my case last night so I baked a carrot cake "à l'argovienne". Aargau (or Argovia) is a canton in the North of Switzerland and is known as the carrot-canton (Rüebliland). There is no actual reason for Aargau to be the carrot canton except that carrots used to be cultivated there centuries ago, and today the carrot is the symbol of this canton. Beat up the eggyolks, sugar and zest until it becomes pale yellow. Add the almonds and carrots, mix. Mix the flour, baking powder and spices and then add to the mix. Beat up the eggwhites with the salt and then carefully incorporate them to the mix with a spatula. Pour the dough in a buttered and floured spring form and bake in the oven at 180C 50-55 min. Heat up the jam in a saucepan and press it through a sieve to get a homogenous warm jam. Spread it on the warm cake (on the top and side of the cake) and then let the cake cool down. Mix the powder sugar and lemon juice until getting a homogenous and viscous mix. Pour it on the cold cake and spread it on the top and side of it (note: add enough lemon juice so that you can actually spread the icing). 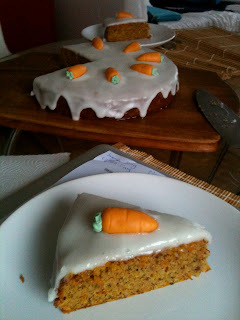 Once the icing has dried, decorate the cake with carrots in marzipan. Et voilà! Enjoy! It is the best carrot cake ever. Not too dry nor wet. Perfect flavour. The icing is just the famous cherry on the cake. Again, every year it gets better!